Hello, and welcome to my website. While primarily devoted to my coiled basketry projects, I’ve also shared some of my other artistic endeavors. My goal is to chronicle my journey from a novice coiler in 2005 to the present. I hope to inspire “newbie” coilers to stay engaged in this centuries old art form that seems to be enjoying a resurgence of late. To help in this, I’ve posted links to several “how to” videos I’ve recorded. I hope to record more videos as time and opportunity permits. There is also a link on the right to my Facebook page where you can see photos of “baskets in progress”. I do hope you enjoy viewing my artistic journey half as much as I’ve enjoyed the challenge. And, while you’re here, please leave a comment. I always love to hear from visitors! So, to whet your appetite to explore some more, here is the very first basket I made back in 2005 from start to finish. And now, over a decade and some 200+ baskets later…..here is one of my more recent vessels completed in May, 2016. Stunning artistry, Carol! What or who inspired you to make your first beautiful basket? Thanks for the light box photography instructions on The art of coiling…I have completed one basket with the Boot Key Babes, & am beginning a second. You are the inspiration that keeps me going. I love how you name your baskets. Dimensions would be helpful, too. Where can you purchase the sinews you spoke about in your videos? Thank you for posting your videos! 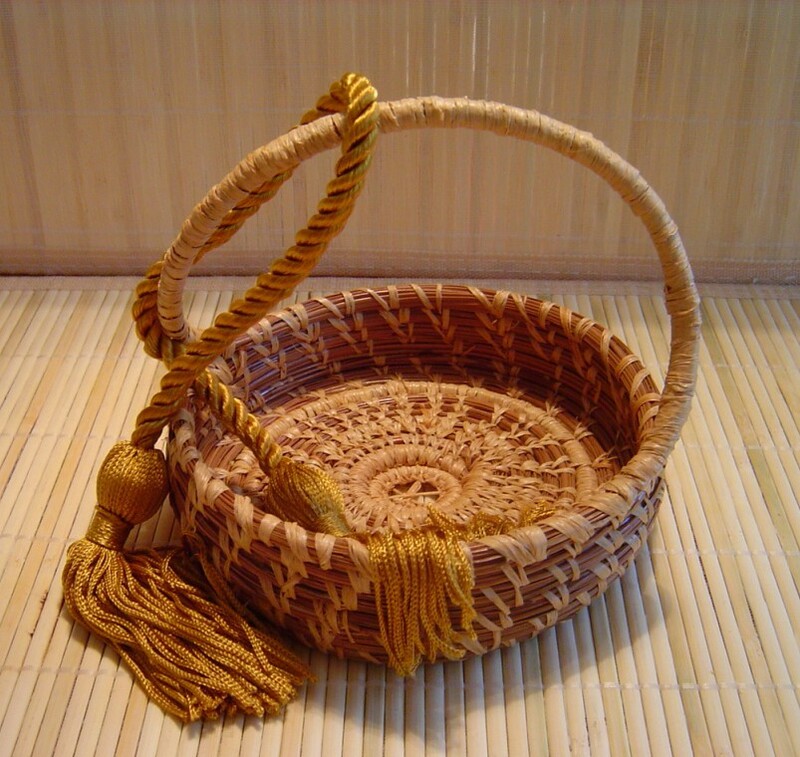 I weave baskets and in the past I was introduced to pine needle baskets but have never made any. My daughter purchased a pine needle basket kit for me on a trip she went on as a gift. As I set down to make the basket, I found the directions confusing. They say a picture paints a thousand works, well, your videos did that for me. Thank you for sharing your talent and know how with others. I hope one day to have pine needle baskets added to my repertoire of basket making skills. I also read about your trials with your mother. My parents are both in a nursing home and I understand what you had to deal with. Life is never easy—always a challenge. Please keep the videos coming, I would love to learn more. You are truly an artist with beautiful, fantastic pieces. Love your work! And you’re a fantastic instructor, too! you’ve come so far, congratulations. You just keep getting better and better at this. I look forward to seeing your next piece. Beautiful…it is very awe inspiring. I am very much a newbie…and am looking forward to watching your videos for guidance. As a visual person I learn best by watching. I can read but it just doesn’t sink in the same way. Carol, your work is truly inspiring. Looking forward to meeting you in September at Arrowmont. I absolutely love your artistry Carol. They are beautiful! This is really good, I love the story of how you started. You work has evolved over the years, real works of art!